Add oil and salt to dough and process until dough forms satiny, sticky ball that clears sides of workbowl, 30 to 60 seconds. Remove dough from bowl and knead briefly on lightly oiled and floured countertop until smooth, about 1 minute. Shape dough into tight ball and place in large, lightly oiled bowl. Cover tightly with plastic wrap and refrigerate for at least 24 hours and up to 3 days. I strongly recommend making the dough 2-3 days in advance of baking. That way it will give you a nice and bubbly crust (like the photo!). I start by transferring the dough (click for recipe) from the freezer to the fridge the day before baking. The day of baking, i remove the dough from the fridge around 5:30 (or at least an hour before shaping). To shape the dough, i coat a sheet pan with semolina flour (coarse grain cornmeal would probably also work) and press the dough into a disc using oiled hands. I have stopped using parchment paper to transfer pizza to the stone, so the semolina helps to slide the crust onto the pizza stone. After shaping, i like to lightly coat the dough with oil, and let it rest for 5-10 minutes. i think this helps develop better bubbles. Now top the pizza with a little sauce (slow cooked from fresh tomatoes is best, but we often use canned crushed tomatoes). Add your choice of toppings (2-4 max) and then top with cheese (we use sargento’s Italian blend). Maybe a little sea salt or basil. The temperature dial on our oven here does not go over 500° F and i doubt that the oven even reaches that. The dough is so sticky to start with that i have to bake it on the sheet pan for 5 minutes then use a spatula to slide it off, then continue baking for another 7 minutes to crisp the crust. If you can, bake it at 550° F for a total of 7 minutes. 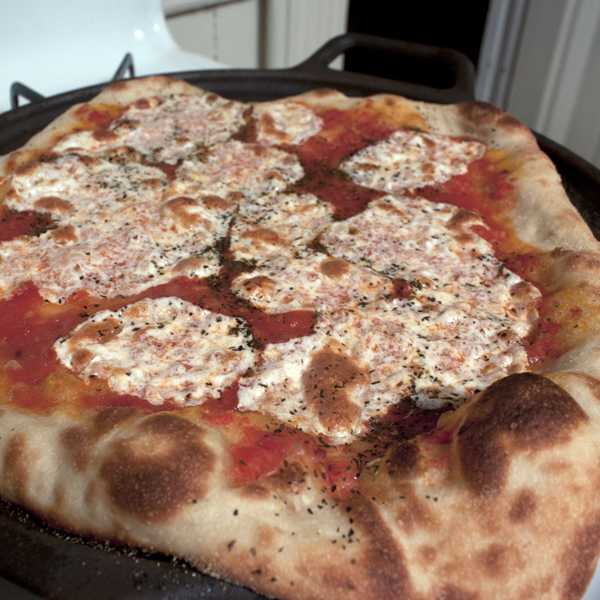 Finally, do NOT rinse your pizza stone. Simply wipe it off and let the hot oven do the ‘cleaning’. 090807 – Pizza Friday is BACK! Whew. Ever since our pizza stone broke a few weeks ago (okay, i broke it by rinsing it with water) I have been craving our homemade pizza! So much so, that i went a little overboard . I usually try to limit it to 2-3 toppings. I just don’t know what happened! I tried a new crust recipe this time and REALLY liked it. It only took about 2 1/2 hours total and was very tasty. I think i would add a smidgin more salt next time (maybe an extra 1/4 t) and push it down to about 1/4″ thick – I shaped ours to about 3/8″ it nearly doubled in thickness in the oven. sprinkle yeast over 3/4 C warm water in measuring cup and let sit for 5 min (until foamy). add additional 1 C water and olive oil to yeast. slowly add water mixture to flour in food processor while mixing on medium speed. continue mixing until dough becomes smooth and elastic. use a rubber spatula to turn dough out onto a well floured counter and knead until a tacky – not sticky – ball forms (7-10 minutes). transfer dough to a lightly oiled bowl, turn to coat, and let sit at room temperature til doubled (2 hours). punch dough down to degas and cut into 3 equal pieces. I was not ready to form the pizzas yet, so i repeated step 6 with the 3 pieces of dough. set a pizza stone on the middle rack and preheat oven to 550°F. to form crusts, press dough ball down and outwards with lightly oiled hands on a piece of parchment paper. Add toppings, then use a cookie sheet to transfer the pizza and parchment to the preheated stone. Bake for 4 minutes, slide parchment out from under pizza, and continue baking an additional 3 minutes.